Following the? ?release of the R.I. Department of Education’s 2017 State of Rhode Island Schoolhouses report, which was the culmination of? 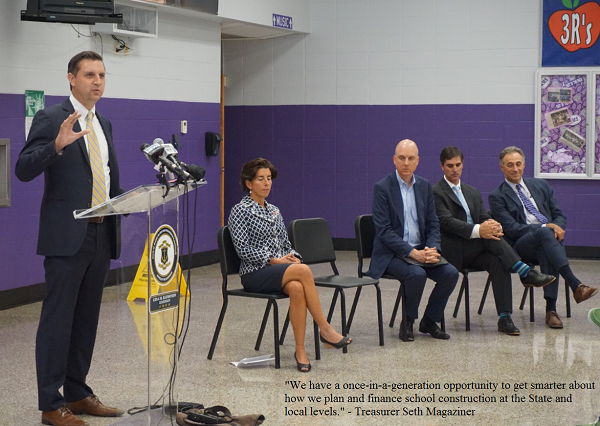 ?a year-long assessment commissioned by the School Building Authority and completed by Jacobs Engineering, Governor Raimondo signed an executive order creating the Rhode Island School Building? ?Task Force. Elizabeth Burke Bryant, Executive Director, Rhode Island KIDS COUNT?? The? ?Task Force, which is co-chaired by Treasurer? ?Magaziner and Commissioner of Elementary and Secondary Education Ken Wagner,? ?will consider policy and financial models focused on how to meet the needs outlined in the Schoolhouses report.???? The Task Force will report its recommendations,? ?which will include? ?potential funding streams and recommendations on how to effectively maximize resources, to the Governor by December 2017.